R. M. Ballantyne : Surf Riding in Polynesia, 1874. 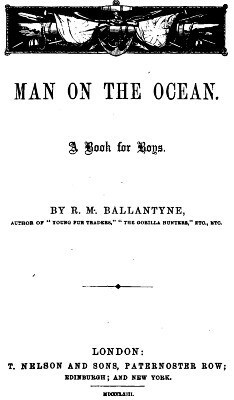 Ballantyne, R. M.: Man on the Ocean; A Book about Boats and Ships. Note that the description on page 208, "winning in the surf," is surely a printing error, the manuscript undoubtedly read "swimming in the surf." 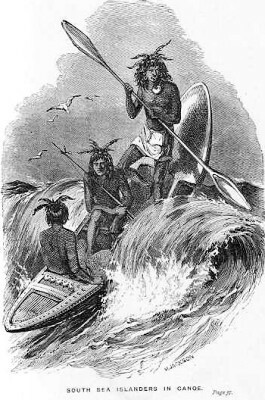 Although Ballantyne composed his account of Polynesian surfboard riding from various texts, most probably Ellis' eyewitness accounts from the islands of Tahiti and Hawaii, published in Polynesian Researches (1831), his dramatic description of the breaking wave, on page 209, is likely his own work. The two illustrations are from the Project Gutenberg edition, they do not appear to be in the Open Library edition. 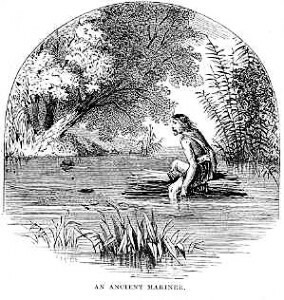 The Earliest Days of Water-Travelling. R. Richardson: An Ancient Mariner. and also note the untypical double bladded paddle and the crew member facing to the rear. AMUSEMENTS: DIVING AND SWIMMING EXTRAORDINARY. It is a curious fact that some of the games played by the little naked savage children of the South Sea Islands are very similar to our own. A traveller who had sauntered to a part of the sea-beach of one of the islands to watch the children at play, tells us that one band was busily employed in playing blind-man's-buff". cloth of native manufacture, and were raised to a great height by means of twine, made of the fibrous husk of the cocoa-nut. But the amusement which these people take the greatest delight in old as well as young, is swimming and diving in the sea ; and the expertness exhibited by them is most extraordinary. They have two principal games in the water ; one of which consists in diving off a sort of stage, erected close to deep water, and chasing each other in the sea. Some of them go down to extraordinary depths; others skim along on the surface or roll over like porpoises, or diving under each other, come up unexpectedly and pull each other down by a leg or an arm. They never seem to tire of this sport, and from the great heat of the water in the South Seas, they can remain in it for hours at a time without feeling chilled. Even infants just able to walk waddle down to the beach, throw themselves into the water, and strike boldly out to sea like ducklings. Mothers, too, jump in with their little infants at their breasts, and gambol with there in the water, as mothers in this civilized land sport with their little ones on grassy lawns. One would think that swimming miles out to sea, and diving fathoms down into the deep, to disport among the lovely coral groves at the bottom, with, now and then, the chance of being bitten in two by a shark, would be excitement enough for these savages. regular majestic thunder, a mighty billow which never goes down, even in the calmest weather. It is not the result of wind, it is the termination of that long rolling swell that moves across the wide sea in a calm, the ocean's breathing, as it were, while asleep. In storms, of course, this billow mounts in size, and rages along intermixed with a thousand superficial waves, and when it reaches the shore it bursts into foam upon the rocks with a savage fury that bids fair to demolish the solid earth itself. But even in the deadest calm the billow rises with its great broad glossy back glittering with the sunbeams, until it approaches to within a mile of the shore. Then it becomes like an emerald wall, its crest overlaps, ripples, breaks, and, with a deep solemn roar it rushes on, a world of snowy water to engulf the beach. It is on this crested wave that the natives ride. They assemble in hundreds on the beach, each with a short fiat board in his hand. Just after a billow has broken they rush into the surf with loud yells, and are carried off by the seething foam of the receding wave. For some time the swimmers continue to strike out to sea, breasting over the swell like hundreds of black seals. There they all turn, and, watching an approaching billow, mount on its white crest ; each laying his breast on the short flat board above mentioned, they come rolling towards the shore, careering on the summit of the mighty wave, with a speed that seems to threaten their total destruction, while the onlookers shout and yell in an ecstasy of excitement and delight. Just as the monster wave is about to fling its bulky length upon the shore, most of the swimmers slide back into the trough behind it. plunging through the watery waste, swim out to repeat the amusement, while a few come reckless on, amid the churning foam and spray, to the shore. A Book about Boats and Ships. Geoff Cater (2013) : R. M. Ballatyne : Surf Riding in Polynesia, 1874.